I was on mother-in-law and work duties all weekend so no chance to go out gathering birds for the year list. As is the norm, the moment I am otherwise occupied the birds come flooding in all over the place. As counties go, Surrey is hard work for unusual sightings, but now and again something unusual will crop up. And so it was this weekend. The story starts with Sutton-based naturalist Steve Gale, out on a walk through one of his regular patches along Juniper Bottom – near Mickleham, just north of Box Hill – looking for plants, when a flock of 12 Hawfinch flew over at about 10.30am. That in itself is a remarkable number for the area, because Bookham Common, the best-known site in Surrey for Hawfinch, has had only one regular visitor this winter. So 12 was a head-turning figure. David Campbell then took up the running on Sunday morning with a couple of friends. What they saw was remarkable. Two flocks of at least 60 and 40 birds respectively, and possibly as many as 130 Hawfinch in all. 130! 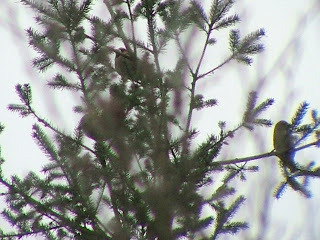 And more than 50 were viewable, perched up in trees along the path. 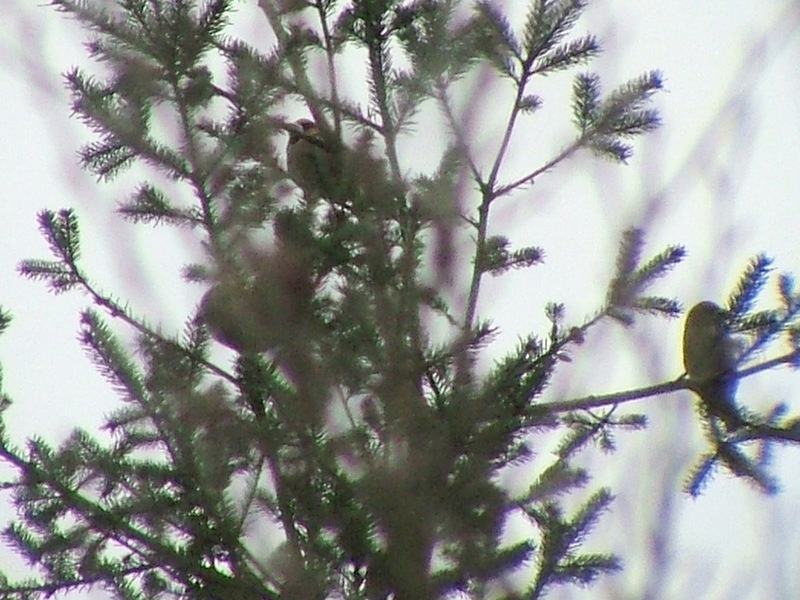 As figures go, 130 is the largest number of these elusive finches seen within the London recording area for 70 years. Truly amazing. The general view is these birds have probably wintered here, but because so few people patrol the Juniper Bottom area for birds they have been overlooked. One of Surrey birding's lost worlds. Needless to say, birders arrived in droves today, although when I got there at 8.30 this morning in a blizzard, only Sean Foote from Tices Meadow was present on the search. He had 60 fly out of a bank of Yew trees about an hour earlier, and he'd seen a few in the trees but it was mostly birds calling he could detect rather than any decent views of them perched. It was quiet for a good 40 minutes as the wind blew and the snow swirled around the trees before a few Hawfinch started flying back to our vantage point. They were spread out in groups of a dozen to just a handful, and they were heading north, south, east and west. A small group landed high up in the firs but most were in flight or very hard to see through the woods. I saw about 40 in all, but it was hard to say exactly how many. It could have been more. After about 20 minutes it all went quiet again. More people arrived as I left. The car park normally only has Steve Gale's car parked in it, but it was now completely congested. I don't think latecomers had any luck seeing the birds as they seem to disappear for the afternoon, no doubt to a popular feeding site. The best to time to witness this phenomenon is early in the morning. Park at Whitehill car park along Headley Lane, and walk up along the bridle path for a good 500 yards until you come to some tall conifers just before a clearing of chopped-down ash trees. Just listen out for them calling and keep your eyes peeled. I'm going back first thing tomorrow. Didn't end up going this morning - just as well by the looks of it.